Kitesurfing, also known as” Kiteboarding “started at the end of the 90’ and become one of the most popular extreme water sports gaining followers all over the world. Kitesurfing is a unique and exciting sport that is the combination of many other watersports: The speed of water skiing, the acrobatic moves of wakeboarding, the precise curves on the waves like surfers and the amazing jumps that makes you literally flying! Hearing all of this makes you feel like you want to run to the beach, get a kite a board and launch yourself into this incredible adventure. Kitesurfing is a sport to be taken with extreme respect! The kites are extremely powerful and can easily become a danger to yourself and to others. Like a wild horse can drag you on the beach or thrown you in the air like a twig. 1 – It’s always best, at least at the beginning, to use the services of a professional school, this will help you to learn more quickly and way more safely than if you try on your own. Not only that but you will save money! Because crashing and destroying a brand new kite can seriously hurt your bank account. 2 – Get informed! There are hundreds of sites on the web where to find information’s about kitesurfing, how to learn, types of kiteboarding equipment, where to do it and all the dangers related. 3 – If there are no schools in your area, try to learn on your own but step by step. Start by flying a small trainer kite specially designed for learning safely also call “stunt kite” normally about 2 square meters. Then read everything possible in the web sites mentioned above and get an instructional Kitesurfing DVD professional made like the one from Progression. Learn to Wakeboard behind a boat to help with your board riding skill. In Bali the best place to start is at kite Beach in Sanur “Pantai Pura Mertasari” where there is huge lagoon with calm water that is perfect for practice. The wind intensity in Bali is never too strong so is very rare that it reach a force such that kiteboarding become really dangerous. Rather there are more days when we wander from one beach to another desperately looking for that gust of air that allows us to glide over the water and dream. 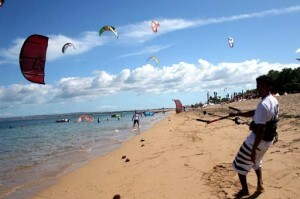 Bali Kitesurfing School, is owned and run by the Balinese kite team, they are very patient and very good in teaching. They only use the latest and best equipment on the market. Water Lessons are all One on One and the instructors follow you at all time in the water in a motorized boat. Rip Curl School of Surf, is an international Kitesurfing school that is associated to IKO. In Bali and all of Indonesia at the moment there is only ONE shop where to find all you need. 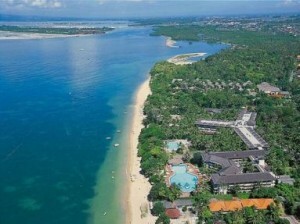 KITE & SURF BALI – THE PRO SHOP located in Sanur very close to Kite Beach. Prices are really convenient compare to any other place in the world and they sell equipment from the best brands like: Cabrinha, Ozone, Underground, Flying Object and more.